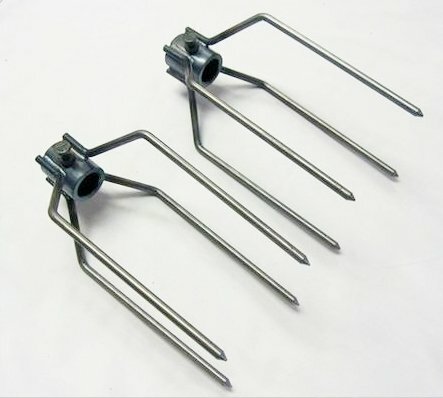 Rotisserie spit forks or meat forks hold the food onto your spit rod. 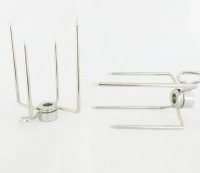 Spit forks are available in two sizes the larger rotisserie forks will also fit onto smaller diameter rods. It is always handy to have more then one set of spit forks, if for instance you want to cook two chickens at a time. Having a couple of different sizes of around is also a good idea. 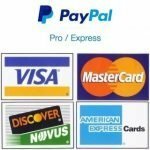 For more about spit forks please scroll to the bottom of the page. We get calls and e-mails all the time looking for larger and smaller rotisserie forks for certain uses. The most common of which is for Cornish game hens. While we have not found any real variation in the size of the spit forks on the market today. What we typically suggest is the bending of two of the tines, while leaving the other pair intact. You can make them wider or narrower using this technique so they will hold just about anything. Bending them inward is easily done on any hard surface by placing the opposite fork on the hard surface and pushing down on the other one. We suggest bending the shorter of the forks inward if your spit forks have different lengths. To expand them just grab opposing tines and pull. We suggest bending the longer of the forks outward if your spit forks have different lengths. Always be mindful of the pointed ends they can tear your hands up. The drawback to this is eventually the metal will get fatigued and they will need to be replaced.